Wearable technology brings productivity to the workplace. On the 25th July I attended Wellbeing 2015 hosted by Reward Gateway, presenting a bold new vision for Corporate Wellbeing with a showcase of the very latest in technology. Throughout the event it became more transparent as to just how important wellbeing is to you, the employer, and how you see yourself as responsible for employee wellbeing in the workplace. Furthermore, it was clear how important you believe it is to remain connected to just how quickly employee wellbeing is evolving. Wellbeing can be anything from your workforce understanding and engaging in the organisation’s values, culture and vision; or by having the latest in wearable technology to guide your employees towards a healthy lifestyle both inside and outside of the working environment. 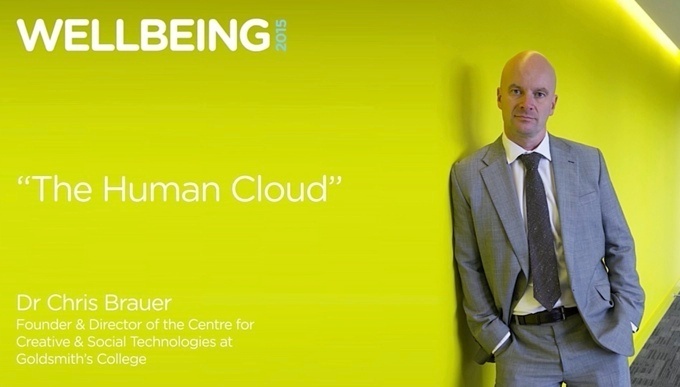 Dr. Chris Brauer, Senior Lecturer at the Institute for Management Studies at Goldsmiths College London came to share his discoveries at Wellbeing 2015. He works with emergent technologies at the intersections of media, social science and computing and is the spirit behind the Creative and Social Technologies (CAST) initiative. Chris spoke to us about the dramatic rise of smart devices in recent years as cloud computing and worldwide internet connectivity connects consumers to information, anytime, anywhere. He explained in greater detail about the take-up of wearable technology and how these devices are enhancing users lives. Supported by quantitative research he then went on to discuss the emergence of six distinct profiles of wearable technology users, and how the data generated by these devices will form part of a Human Cloud, playing host to consumer insights which can be used by organisations to improve services. Wearable Technology takes shape in a new kind of portable device worn on the body. Devices such as Google Glass, the Nike+ FuelBand and Jawbone are just a few examples of the devices available, and they capture the wearer’s activity data in the cloud and provide analysis on their fitness level in order to promote a healthier lifestyle. To the individual, wearables are seen as an opportunity to enhance lifestyle. They give us the ability to analyse data in order to improve performance and push our boundaries. The devices can provide data on anything from what we’re consuming, steps taken, calories expended and sleep obtained, to guide us on a journey to a healthier lifestyle. To the employer, it’s a new way to measure the health and wellbeing of its workforce. If the employer knows what levels we are going to need to keep fit and healthy, what our diet consists of and how much sleep we’re obtaining then this would help them to understand potential dips in productivity and performance. Chris Brauer says that, “The rich data created by wearable tech will drive the rise of the ‘human cloud’ of personal data”, and with this, an opportunity is created for employers to encourage their employees to use wearable devices, in order to earn rewards for maintaining a healthier lifestyle. The healthier lifestyle would then lead to a happier, more engaged and productive employee. On one hand, I can see how this could help release employee potential. It gives employers the ability to take a personal approach to each employee and helps them determine what set of circumstances will help that employee be most efficient. But on the other hand, isn't it too invasive to impose these metrics on employees’ personal lives? Could their be an opt-in, opt-out approach initially or long-term? Despite the many benefits that wearable technology is set to deliver for both consumers and organisations, there remain serious concerns about privacy and security. There’s no doubt, as with all new products that are cutting-edge, that there will always be the question of how current laws, combined with consumer expectations, fit in with the product and how it’s exploited. In collaboration with experts in the field of social studies and technology at the Centre for Creative and Social Technology (CAST), Dr.Chris Brauer analysed in detail how 26 people used wearable technology in their everyday lives, supported by quantitative research among over 4,000 UK and US adults. The study found that 47 percent of British and American wearable technology users felt more intelligent and 61 percent felt more informed. 37 percent stated that wearable technology helped with career development while 61 percent claimed that their personal efficiency improved. Given these advantages, it is perhaps unsurprising that 13 percent of wearable technology users never removed the device during the course of the study with another seven per cent admitted to checking the device at least once every five minutes. Whilst these statistics make for interesting reading, wearables are still at an early stage when it comes to the devices on the market and there is plenty of room for improvement. The research conducted by CAST revealed a common frustration with the quality and accuracy of data provided by wearable technology devices. The study is a good example of how wearable technology can be a benefit to both employer and employee, but where do we draw the line on this? Some employers will treat this responsibly and it will be optional for employees as to whether their data is used to analyse productivity, but many others won’t. Is it difficult to imagine a brave new world where wearables are compulsory and failure to meet health and wellbeing objectives is punished? Another interesting point about wearables in the workplace centres around who will take control of this data first, the employer or the employee? Will an employee be able to speak to their employer about what their data means and how it correlates to their productivity? Or will the employer take it into their own hands? Imagine your manager knowing you’d only had 5 hours sleep the night before and using that information to pre-determine poor levels of productivity. How would you feel? In this world of early adoption consumables, it seems obvious that this data would empower the individual much earlier than it would be imposed upon the employee by an entire organisation, so in actuality, this is the more likely scenario. Wearable technology has the potential to be both useful and entertaining. However, how interested are we in using these devices? Can they enhance our lifestyles and productivity or will they just cause more stress as users suffer from information overload? Will concerns around privacy detriment consumer adoption of these wearables? I think the message we can take from this is simple. Employers need to take a proactive approach to health and wellbeing now to show their employees that it’s important to them and to show them that they care. Companies need to take control of their health and wellbeing agenda, communicate its importance to employees and above all, remain nimble so that health and wellbeing remains a common goal for both employer and employee. Mark Burrett is a former Employee Engagement Consultant at Reward Gateway, a dad, and a fitness enthusiast.